You can discard this card; add 1 “Lair of Darkness” from your Deck to your hand. 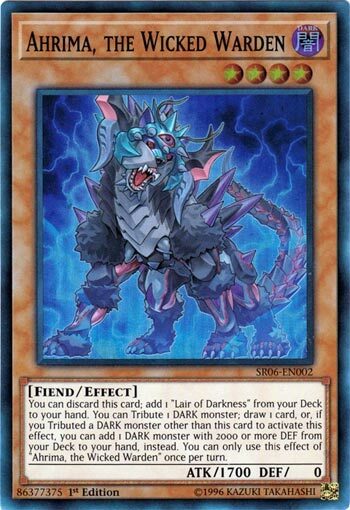 You can Tribute 1 DARK monster; draw 1 card, but if you Tributed a DARK monster other than this card, you can add 1 DARK monster with 2000 or more DEF from your Deck to your hand instead. You can only use this effect of “Ahrima, the Wicked Warden” once per turn. Ahrima, the Wicked Warden starts off the week as we transition into May. Field Spell searching card for the Lair of Darkness monsters and a 1700ATK beater that has a pretty good search effect in addition to its discard effect. Tribute a DARK to draw, but if you don’t use this monster you can get a 2000DEF or more DARK search. This card gives you incentive to tribute something other than itself, and in combo with the field spell it searches this is easily possible. They lose a monster, you get a search or a draw. Regardless, this card is always good for its draw, breaking even. There are plenty of DARK monsters to tribute in many decks out there, and this monster could be dropped in there to help with some draw support. Its stats are high enough, its combo-friendly, and has Rank 4 synergy. Run it in 3’s in the Lair of Darkness deck, test it out in other focused DARK decks if there’s some room for tech. Ahrima, the Wicked Warden is a Level 4 Dark Fiend-type monster with 1700 Atk and 0 Def. It has a lot going for it. You can discard it to search Lair of Darkness which will put a Dark in the grave for you. If it’s on the field it can tribute itself to get you a draw. If you tribute a different Dark monster for the cost, you can search a Dark monster with 2000 or more Def. I like that you can tribute an opponent’s Dark monster while Lair of Darkness is on the field and still opt to get the Draw effect. Finally, Ahrima is a decent beater and the perfect Level for the effects. You’d probably run 3 of these, but it’s not as splashable as some of the other cards in the Structure Deck. With the release of the new Structure Deck in the TCG, we decided to look at more cards from the deck. Here’s one of the new monsters in the deck, Ahrima, the Wicked Warden. Ahrima is a Level 4 DARK Fiend with 1700 ATK and 0 DEF. Stats are fine, 0 DEF has benefits on a DARK. Fiend is a solid type as well. While in the hand, you can ditch Ahrima to search for Lair of Darkness. Go read the review on Lair of Darkness for more details, but it is a great card so it’s nice to have its own searcher. While on the field, you can tribute a monster to draw a card, but if you tribute something other than Ahrima, you can instead search a DARK Monster with 2000+ DEF. If you search the new boss monster, I believe you can immediately use its effect to summon it. Besides that, it is nice for bigger DARK monsters to have a searcher. This is a hard once per turn but that’s fine, Ahrima is worth considering for many DARK Themes.